The Bouregreg Bridge is definitely one of the most spectacular bridge projects at the present time. The 952 m long cable-stayed bridge near the Moroccan capital Rabat symbolises the modernisation of the country’s infrastructure. Architecturally, it stands out for its two pylons – one 197 m, the other 185 m tall. 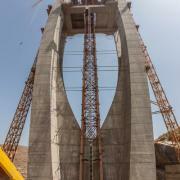 Their artistic shape also presents the Formwork Experts with some special challenges. 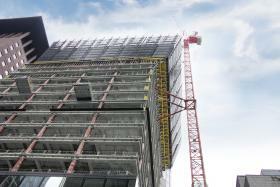 The solution Doka developed for them is based on the Automatic climbing formwork SKE100 system. 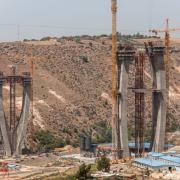 The cable-stayed bridge is the centrepiece of an important new motorway bypass around Rabat. The name of the structure derives from the ‘Bou-Regreg’ river and valley that it crosses. 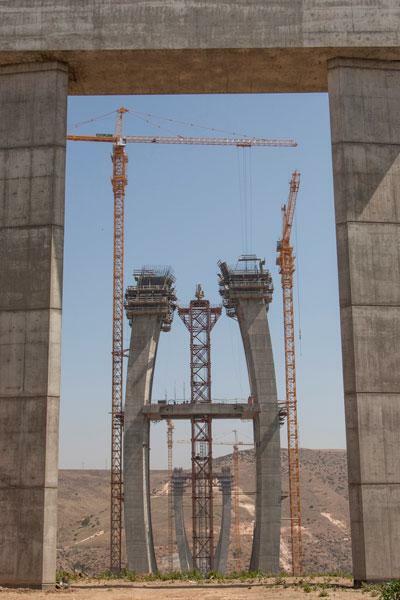 Hervé Vadon, of the French architecture firm Strates, drew his inspiration for the design of the 952 m long bridge and its pylons from the characteristic pointed arches of Islamic art. The span between the two oval main piers, through which the deck of the bridge will pass, is 376 m long. 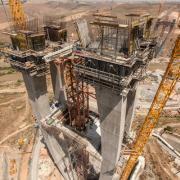 In winning the ambitious Bouregreg Bridge project, Doka Maroc SARL-AU won one of North Africa’s most prestigious showcase projects: “Doka’s many years’ experience with pylons all over the world, and the great co-operation we have experienced from them on other projects, were what swung the decision to award the contract to Doka”, explains Zhao Wenyi, Project Manager of the contracting joint-venture MBEC-COVEC. 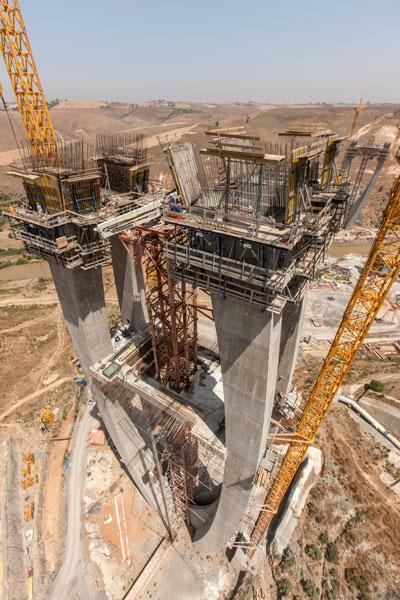 In both aesthetic and architectural terms, the two bridge pylons make some very tough demands of the formwork engineering involved. The oval pylons are each made up of four curved pillars, lending this massive structure a stylish and open aspect. Visually, the bridge-deck separates the upward-tapering main piers half-way up, taking the roadway through between them. “For the Doka Formwork Experts, this meant uniting several different sectors, with differing layouts, into a single work of formwork planning”, explains Daniel Maderthaner of Doka Engineering. 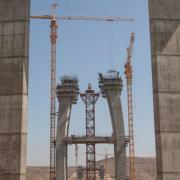 The inclination and cross-section of the 197 m and 185 m tall pylons change after every single casting section. The Doka technicians planned an individual solution, based on Automatic climbing formwork SKE100, for each casting section. This solution requires only minor modifications to the system, and makes efficient use of the equipment. Despite the great versatility of the climbing system and the fact that it allows rearward inclination, custom components and telescopic platforms were developed and fabricated to deal efficiently with the continuous changes in inclination. Combining this climbing system with versatile ‘Large-area formwork Top 50’ made for an efficient overall solution. The basic elements of the formwork stay the same in every casting section. A very few modifications to the construction are all it takes to manage complicated layouts. 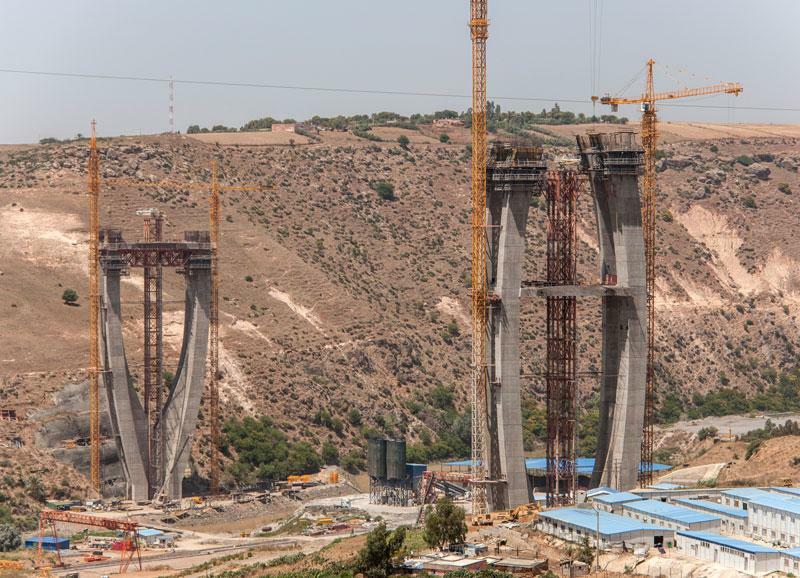 The bridge pylons are each being formed with 40 units of Automatic climbing formwork SKE100 and around 220 elements of the Large-area formwork Top 50 system. The client was looking for a system with which the desired construction progress could be achieved quickly, even in windy conditions. The 45 (48) casting sections, each up to 4 m high, are being completed in weekly cycles in some cases. The high-performing crane-jumped Climbing formwork MF240 and Large-area formwork Top 50 are being used on the five piers in the foreland zone. This solution was also used on the concrete plinths for the pylons. The overall aesthetic impact of the structure is emphasised by the quality of its fair-faced concrete, and especially by structure matrices in the concrete of the two main piers and of the adjacent piers. The formwork systems in use here are enabling the site to achieve first-rate surfaces that more than meet the visual requirements. 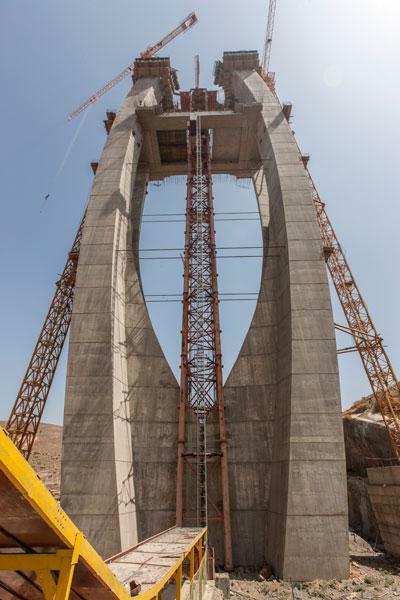 The formwork planning for this prestige project in Morocco was carried out in collaboration with experts from Doka Headquarters in Amstetten. A team comprising staff from the Highrise and Pylons Competence Centre, from Doka Engineering in Morocco and from the Statics Department delivered precisely detailed plans to make this challenging architectural concept feasible in practice. Doka Formwork Instructors were on-site to help with correct assembly of the Top 50 and SKE100 elements, ensuring that the systems were assembled and erected at speed. Thank you for your interest - Exquisitely ‘formed’ with a flexible formwork solution. Thank you very much for your interest - Exquisitely ‘formed’ with a flexible formwork solution.